Cool and clever guitar gift ideas! Finding the best gift for a guitar player might seem tough at first. If you really think about what they’d like more than anything for their birthday, Christmas or pretty much any other occasion the answer you’ll likely come up with is: another guitar. But guitars are expensive, so you’re probably going to want to go with something a little less pricey. Guitar players always need inexpensive items like strings, straps and picks. Those are nice ideas if you know what to look for, but the problem is musicians are pretty choosy about the gauge, brand and even color of the accessories they use. You can ask, but you’re going to spoil the surprise! The good news is that guitarists are drawn to just about anything that has to do with guitars. It really isn’t hard to find awesome stuff they’ll love, and this article can help. I've been playing guitar for over 30 years. That’s more than thirty Christmases and thirty birthdays. In this article you’ll read about some of my favorite things I’ve been given as gifts over the years, along with ideas for new players and some items on my current wish list. Hopefully it will help you figure out what to get your own guitar player. Here are my top recommendations when it comes to gifts your guitarist will never forget. Here are my top suggestions when it comes to gifts for guitarists. Mini Amp: Small, battery powered guitar amps allow musicians to play and practice anywhere. 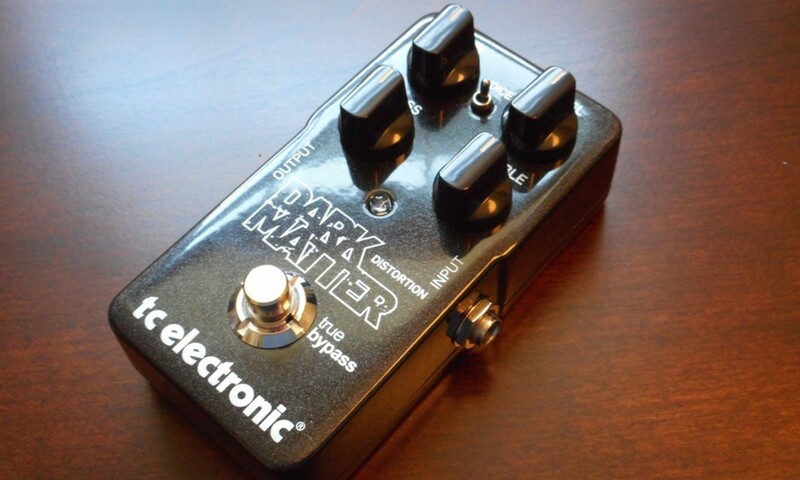 Guitar Effects: Guitar players love effects pedals! Accessories: Affordable tuners and other items are must-haves for any guitarist. Learning Materials: Every musician has room for improvement. Gift Cards: A gift certificate to their favorite local or online music store lets them pick out exactly what they want. Rocksmith: Rocksmith is an innovative game and one of the best ways to learn to play guitar. Mini Guitars: Consider a mini guitar replica for their office desk or bedroom shelf. 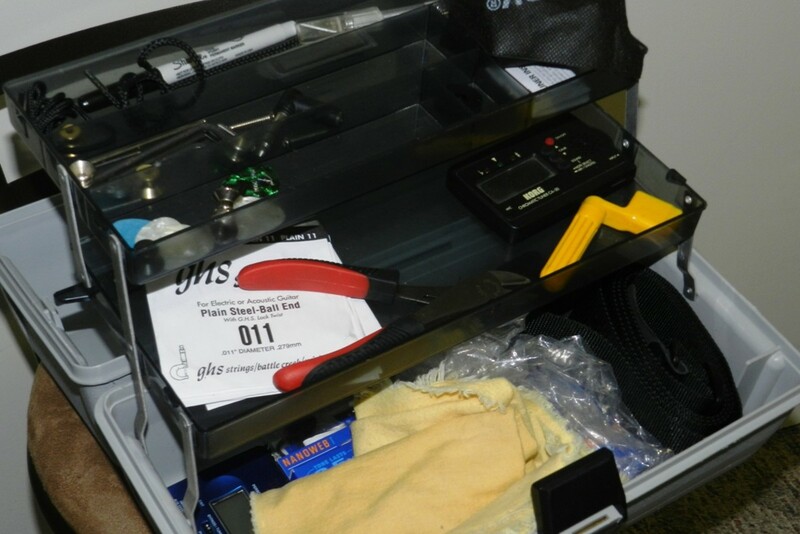 Guitar Tools: A handy toolkit or organizer is a thoughtful gift for musicians. Songbooks: Give your guitar player the gift of new music. You can read more about specific items I really love below. Many of these suggestions are gift ideas under $50, so trust me when I tell you that don't need to spend a lot money to impress the guitar player in your life. 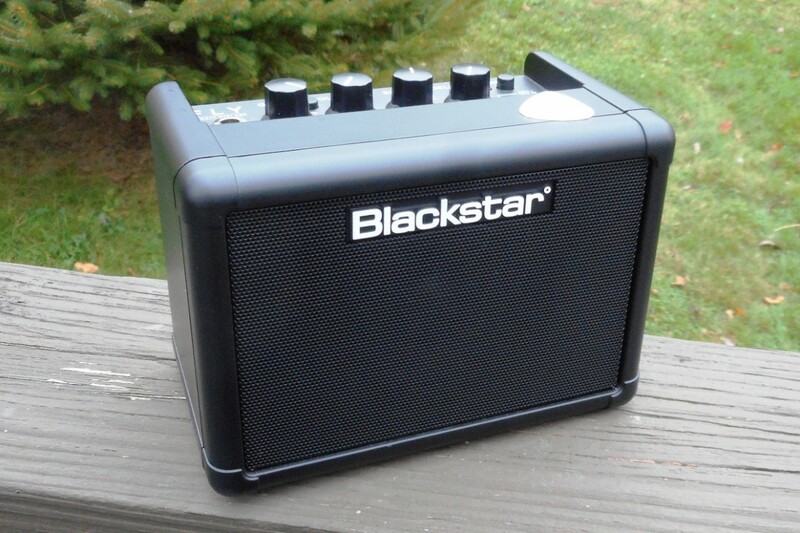 The Blackstar Fly is, in my opinion, the best mini guitar amp out there today. My wife got this for me last Christmas and I’ve been thoroughly impressed. Mini amps are tiny, battery-powered guitar amplifiers that allow a whole lot of flexibility for guitarists. Instead of being tethered to the wall via a power cord, a guitar player can practice and play just about anywhere. I keep my Fly on the edge of my desk, and many days I use it for practice when I don’t feel like cranking up one of my bigger amps. I’ll take it to other rooms of my house, or outside on my deck if I need a change of scenery. I can't do that with my Marshall, at least not very easily or in a way the neighbors would appreciate. You may have more adventurous ideas for the Fly, like using it while camping, or even for busking. Most amps in this category seem like toys, but the Fly is built like a little tank, and it sounds amazing. It covers every genre - from rock to country to blues to metal to jazz – so you don’t have to worry if it will be the fit for your guitarist’s style. There’s an MP3 line-in for hooking up an audio device, and a headphone jack for when you need a little peace and quiet. There is even an optional extension cabinet for stereo operation. If you know the guitarist in your life has been dreaming of a new amp but can’t manage it from a cash perspective, this is the next best thing! Guitar amps can be pretty expensive, but effects pedals let you drastically change your sound for a fraction of the cost. I normally wouldn’t recommend a distortion pedal as a gift. They are so specific in their sound, and musicians can be pretty picky. Some pedals are made for heavy metal, some for light rock or blues, and some land somewhere in between. 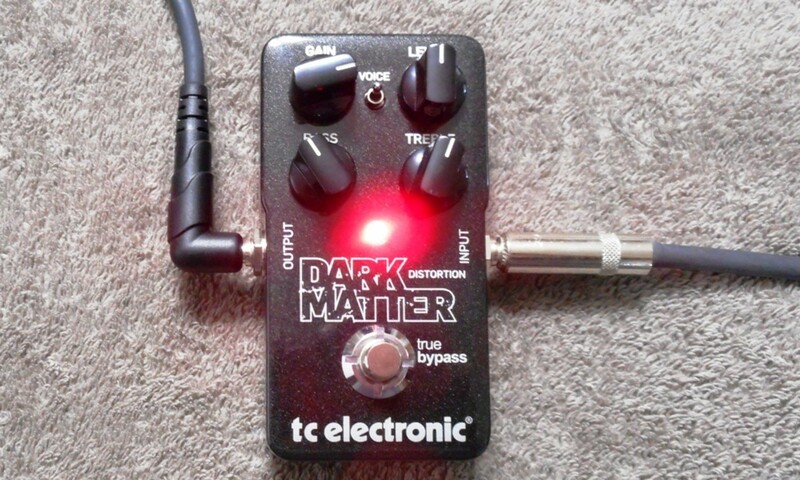 However, the TC Electronic Dark Matter is a super flexible pedal, and I think a guitar player would love it no matter what kind of music they play. I know I love mine. This was another Christmas gift, this time from me to me (wink). Technically, it was purchased with a gift card my mother-in-law gave me. (More on that later!) I’ve been using it with both tube and solid-state amps for almost a year. When I need distortion I am playing primarily metal, rock and blues, and I can dial in the Dark Matter for all of those styles. It sounds fantastic, with the texture of a tube amp. It’s also surprisingly affordable for a quality pedal. It’s battery powered via a single 9 volt, and has an optional power supply jack. The Dark Matter Distortion in action. Like most guitar players, I use an electronic tuner to help me keep my guitar in tune. And, like most guitar players, I always used the kind I had to plug my guitar into. That was really all that was available throughout most of my guitar-playing lifetime. Frankly, putting my amp in standby, unplugging the power cord, plugging into the tuner, tuning up, plugging back into the amp and turning it back on was always a major pain. Then I discovered the Snark Tuner. These inexpensive little units clip right onto the headstock of the guitar. I tune up without ever having to mess with my setup, and I’m ready to go. Easy peasy. The version I have even features a metronome, so after the guitar is tuned up it’s useful for practice. 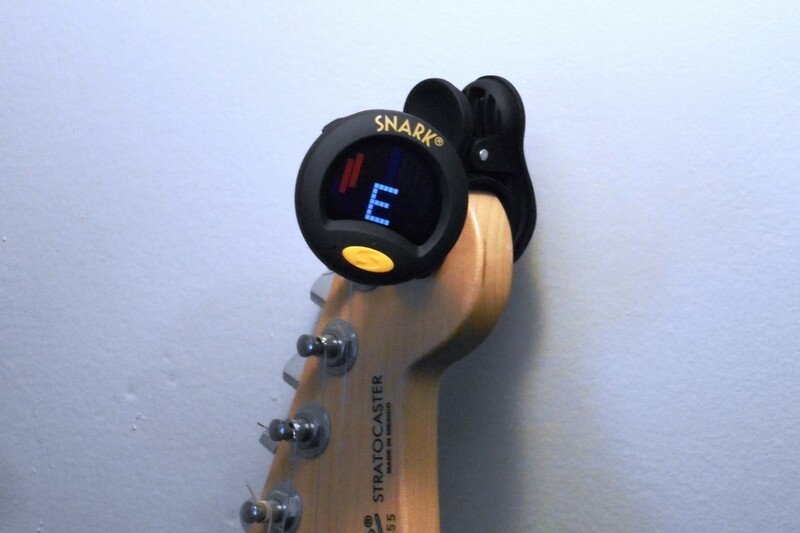 Snark tuners work for electric or acoustic guitars and even bass. They make great inexpensive gifts for guitar players or a thoughtful stocking stuffer at Christmas time. The right tuner might seem like a simple thing, but I can tell you from first-hand experience that saving your guitar player from a little bit of hassle every day will be much appreciated! Snark Tuners clip right onto the guitar headstock. There are many, many books available to help you learn or get better at guitar, and as a self-taught player I’ve been through a ton of them. Most are relegated to the dark, rarely visited corners of my brain, but one book I not only remember but still use today is called Fretboard Logic. The guitar is a somewhat confusing instrument. On piano all of the notes are in a straight line, and it’s pretty easy to see how they all fit together. But on guitar you have six strings, and therefore six straight lines. When you talk about scales and chords on guitar you are usually working across several strings at once, and how those dimensions fit together sometimes isn’t to clear. Fretboard Logic helps you make sense of all that, using a concept called CAGED theory. In a nutshell, it’s a smart way to look at the guitar fretboard using some basic chord shapes that even beginning guitar players will know. And, if your guitarist happens to be a beginner, this book provides a smart method for lifting a lot of the haze that comes along with starting out on the instrument. But this book isn’t just for beginners. I’d actually been playing for about 20 years when I first picked up Fretboard Logic. I already knew a lot about guitar and music theory, but the information here provided a spark that really brought it all together and helped me see the guitar in a more logical way. 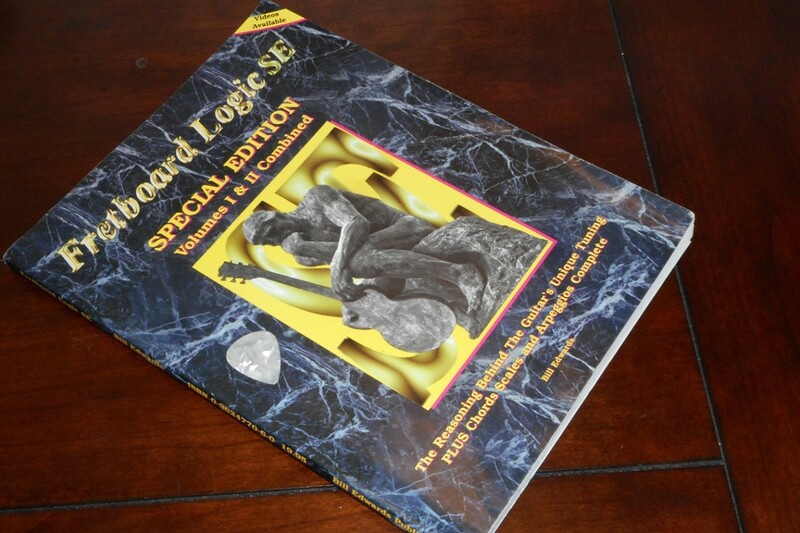 My aged and weary copy of Fretboard Logic SE. I love getting presents I can open just like everyone else, but I'll admit I especially appreciate it when someone gives a gift card for an online store or guitar shop. And, it makes life easier for the gift-giver as well, which makes me feel good. Especially if they themselves are not a guitar player it can be tough to figure out exactly what to buy. With a gift card you can be sure your guitarist is getting exactly what he or she wants, with no returns necessary. If you know your guitar player likes a certain guitar shop or local music store, consider a gift card specific to that establishment. Or, since many musicians shop online these days, you can go with a respected online merchant. It might seem impersonal, but trust me: Guitar players love gift cards. It’s free money they can spend in their favorite place in the world, and what could be better than that? It’s easier for you, and a jackpot for them! You’ve probably seen those guitar video games, where the player has to hit a bunch of buttons to replicate the playing of famous guitarists. They look cool, and I bet they’re fun, but they do little to really improve your playing or teach guitar. Frankly, I don't like them very much. I don't understand why someone would spend time messing with a video game and virtually learning songs on guitar when they could be learning songs for real, on a real guitar. This is something different. Even though there are versions available for Xbox, Playstation, PC and Mac, this is no game. Rocksmith is a powerful and innovative method to learn and improve at the guitar, put together in a fun and interactive way. If your guitar player is constantly struggling to improve at the instrument, Rocksmith may be the perfect gift. They can learn their favorite songs note-for-note and improve their skills all while playing a real guitar and following real tutorials. 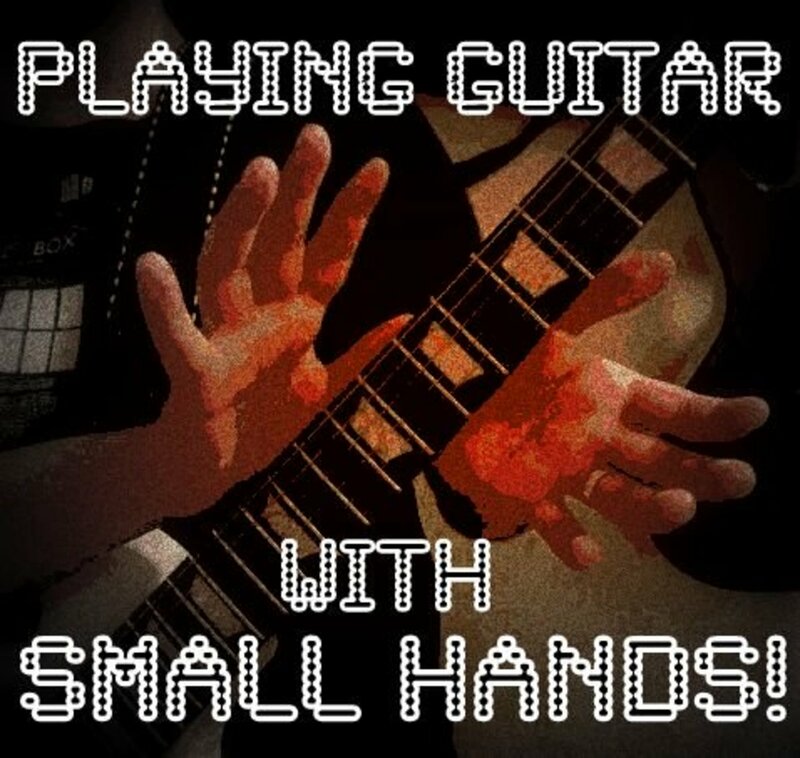 A computer (or video game system) is a useful tool for learning guitar, and Rocksmith does a great job of providing a fun and interactive environment. I wish they had something like this when I was first learning to play, though I guess it would have had to be an Atari 2600 version! These awesome little guitars are about the size of a Coke bottle, and will look great on a desktop or shelf. There are some cool Fender models, licensed by Fender and with typical Fender styling. They’re sure to attract the attention of every guitar player in the room. They are replicas of real-life guitars and the intricate detailing is pretty amazing considering their size. This gift is especially impressive if you know the type of instrument your guitarist plays and can find a similar mini-model. Or, if they’ve always said someday they’d own a real Fender Stratocaster, now is your chance to make their dream come true! There are also some replicas of the instruments wielded by famous musicians like Eddie Van Halen, Jimmy Page, Slash and the Beatles. Many look really good, with impressive craftsmanship and attention to detail. 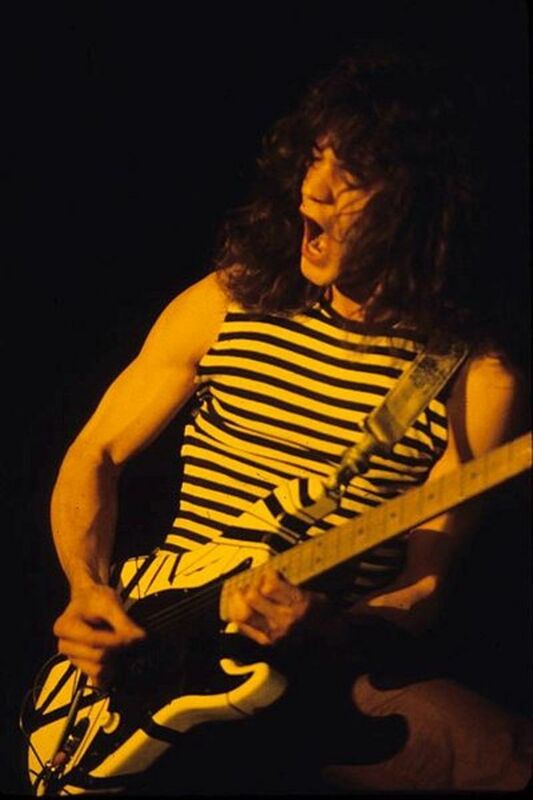 Last year I got a miniature copy one of Eddie Van Halen's guitars for Christmas. 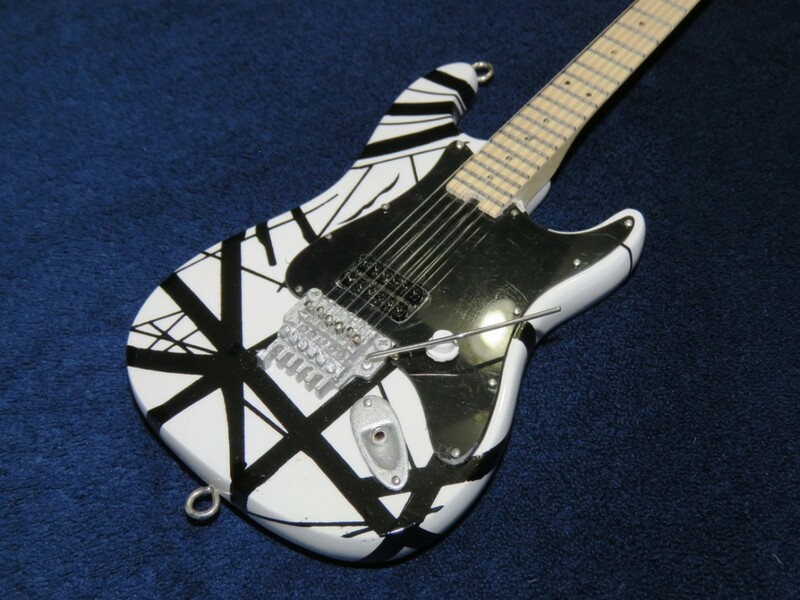 It's the black-and-white superstrat he used on the first album. So cool! To be fair, it is a copy of one of his modern guitars, based on the vintage guitar, but I still love it. Guitar players are great at tinkering with guitars, but not always so good at keeping everything organized. Most electric and acoustic guitars need constant adjustments and care to keep them in top working condition, and musicians soon learn to give their instruments the proper attention. My guitar supplies used to be everywhere. After far too many years of losing tools I finally came up with a way of managing everything in one easy-to-carry case. At the time I didn't realize there are already cases like that on the market, and they are pretty affordable. I could have saved myself some aggravation by simply grabbing one of those. Providing your guitarist with some great tools to get the job done can make life much easier, not only for them, but for everyone who lives with them. Tools and guitar parts scattered around the living room aren't always appreciated by every family member. This I know from experience. These neat and handy little kits should help them stay more organized. Some even come with cleaners and polishes too, which are very useful. Everything has it's compartment to store it in, and the case is small enough to fit in gig bag. My guitar tool box. Ugh! Yes, there is a better way. 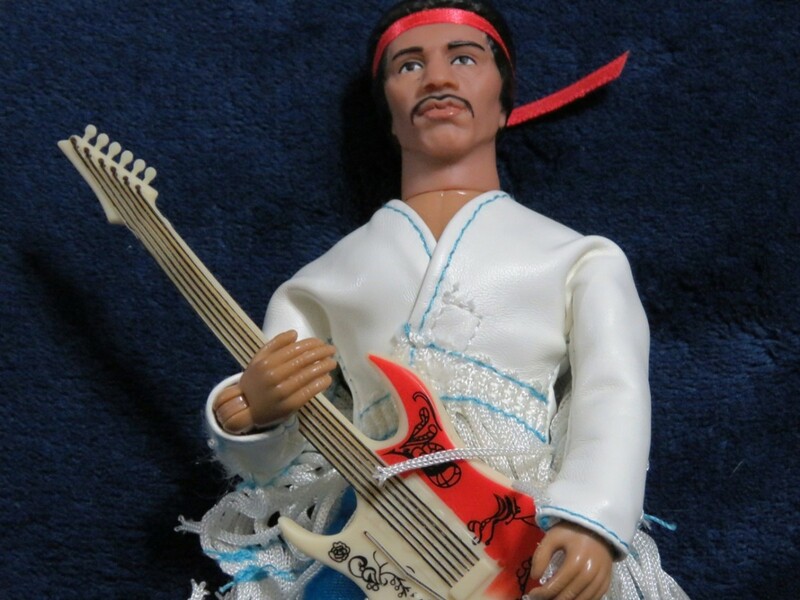 Every guitar player has heroes, and every hero deserves to be immortalized as an action figure! But these are not action figures for kids, the kind you send off to battle against your G.I. Joes. These figures are lifelike, collectible models of legendary guitar heroes, designed to look great set up on a desktop at work or somewhere in the home where people will notice them. Mego was a toy company that produced really cool figures back when I was a kid. They're back, and they are making some interesting choices as far as which figures to produce. One of them is Jimi Hendrix, and I when I discovered this I decided it was time for an early Christmas gift to myself. I really like this figure, but you can see in the image below that they kind of messed up with the guitar. We all know Jimi played an upside-down left-handed Strat, not a lefty guitar. Come on, Mego! As of this writing Mego also has a Paul Stanley figure, and presumably many others to be released. They also have a few others I think I need to pick up, such as the Fonz and Spock from Star Trek. That has nothing to do with guitars, though! Guitar players need something to play, and tablature songbooks with lots of songs in them can keep them busy for months. Tablature is a simple, universal way for guitar players to understand the notes on the guitar, so even if they do not read music they can easily understand a tab book. The Guitar Tab White Pages books are some of the best collections available with songs in all kinds of different genres and styles, from rock to jazz to metal to purely acoustic music. As a nice bonus, these books will benefit the entire family if you’re all tired of hearing the same songs over and over. Enough with Smoke on the Water, already! Learn something new with a tab book. Finding gifts for the holidays or a birthday or any other event is never easy, but if you’re shopping for a guitarist at least you know where to start. Any of the items listed above are sure to get a great reaction. Musicians might be quirky, but they definitely know what they want, and guitar players want guitar stuff. 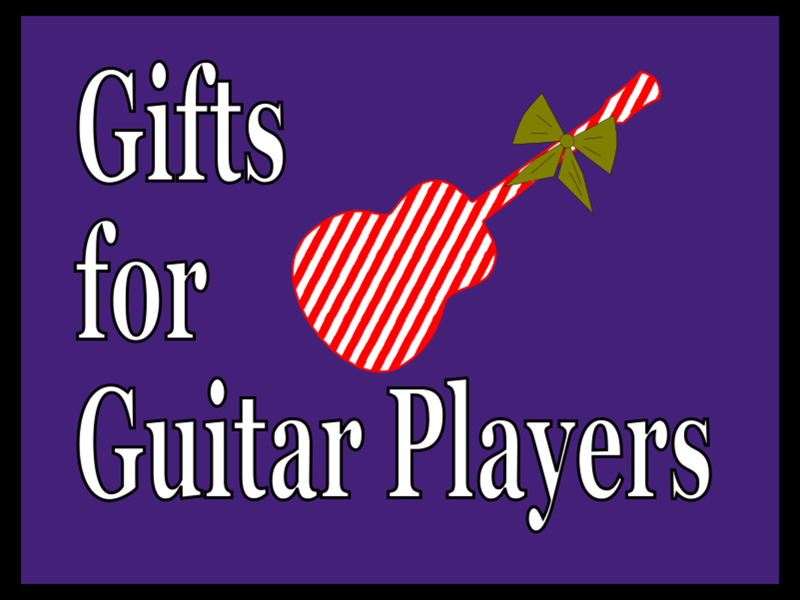 But just in case you didn't find something you like, here are a few more articles with some great gift ideas for guitar players. What holiday are you shopping for? When will you surprise the guitarist in your life? Those Chord Dice are a great tool for songwriting. Nice idea! Love the personalized pick idea- so using that. I also like to give Chord Dice to my guitarist friends. A little hinting can't hurt at this time of year, Earl! Thanks healthyfitness. Hope your friend likes his pick! Oh wow I never even thought about a customized pick! Will be picking one of those up for my friend who plays the guitar. Great article!